Bronx Arena administrators frequently review data that represents large groups of students. As a non-traditional transfer school, Bronx Arena focuses on metrics beyond academic performance, such as attendance and output. This data is updated daily and tracked through a customized platform officials at Bronx Arena built, called the Tracker. 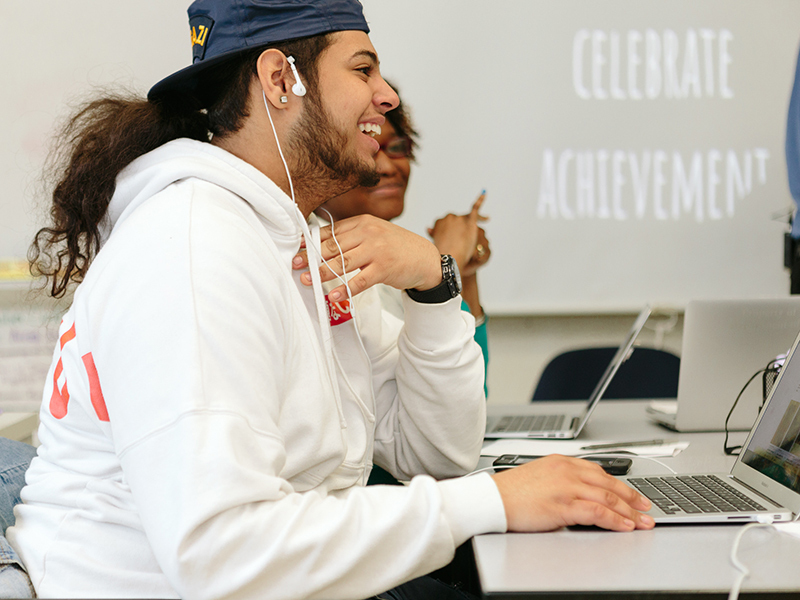 Bronx Arena focuses on a few larger data sets to help ensure its educators are providing the right types of instruction and supports for students. Arena Data - Often, data is viewed at the “Arena” level (Bronx Arena’s name for classes) to see if there are any trends within a class that need to be addressed. If an Arena’s work output is dropping, for example, an administrator could check in with the teacher to try to understand why. In instances like this, a substantial amount of that Arena’s students may be working on learning tasks that take longer, such as capstones, which would be a perfectly valid reason for reduced output. There could also be an academic issue, in which case additional training may need to be provided to that Arena’s teacher. Students in Arenas can use Arena Data, along with their individual data, to set goals for themselves during Group (an advisory class). Measuring Arena-level data helps build cohesiveness among students in each class, in addition to providing clarity and opportunities for constructive conversations when the data does not reflect the appropriate amount of learning productivity. 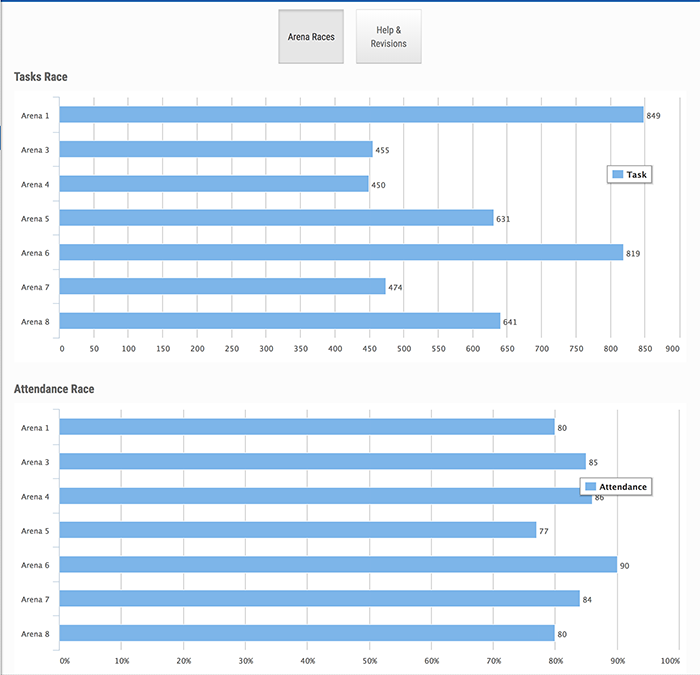 School-Level Data - Administrators will look across the school to see how Arenas are performing compared to one another. Since there is no single instructional focus within an Arena, student output is the common measurement used. If administrators notice that one Arena is an outlier among the rest, they are able to have open and informed conversations with the educators in that Arena to find out why. School-level productivity data is also used for incentives. For example, the school may issue a challenge that the first Arena to earn 100 credits gets a team lunch. Revisions - Educators at Bronx Arena are able to see how many times a student revised a learning task. They can view this data as a total number of revisions for that learning task, as well as an average number of revisions per student. If a task is continually being revised, this signals to educators that there is a problem with the task. Tasks with too many revisions are often the result of two common mistakes: a lack of clarity for what the student needs to do to complete the learning task, or a lack of appropriate scaffolds provided to the student in advance of the learning task. This information helps educators identify learning tasks that need to be altered and address them, improving the curriculum for future students. Happy Accidents - Educators at Bronx Arena prioritize identifying joyful and unexpected things performed by teachers or students throughout the year (e.g. a student suggesting and completing a unique approach to their senior portfolio). This is an incredibly broad and imprecise metric, but an important one that informs their instructional model. These moments help identify what’s really resonating with students and staff, and see if they can create more opportunities for it in the future. It also helps identify systems and structures that are working ok, but take up a lot of staff time without producing positive experiences, and look for technology interventions that might lessen this time burden. Lastly, it helps create a culture of innovation among staff and students, who are not required to follow a rigid model and are able to try new things within the coursework in hopes of improving it further.